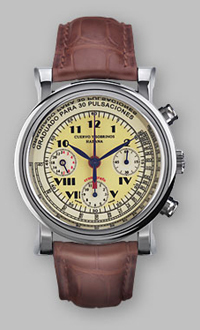 43mm stainless steel case, chronograph, with an automatic movement. It comes on a crocodile leather strap, with a stainless steel folding buckle. Each Cuervo y Sobrinos timepiece comes in a special humidor case.